There are a lot of raging controversies in California's water policy, but finding water for fighting wildfires isn't one of them. First up, KQED called Cal Fire to find out whether, in fact, they're having any problems getting enough water to fight current wildfires. "We are not having any issues accessing any water supplies," says Cal Fire spokesman Scott McLean. "We have plenty. The fires are right near reservoirs. We're doing the job, we're fighting the fight, we have the resources." Indeed, the notion that there are water sources in the state that are being diverted is "patently ridiculous," according to Daniel Swain, a climate scientist at UCLA. "[Firefighters] are drawing water from pretty much every available source," says Swain. "Every reservoir, river, pond, lake that exists near these fires is essentially fair game for these firefighting efforts." 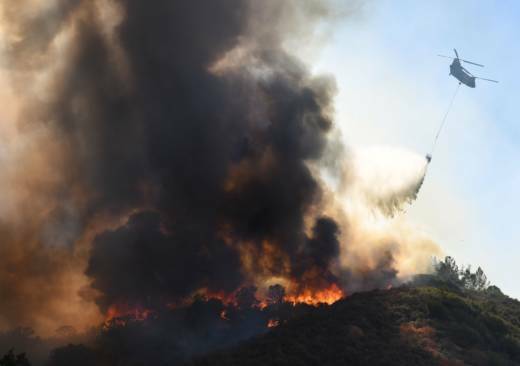 So what then, is to blame for the ferocity of this year's wildfires? The consensus from scientists is that climate change, not lack of water, has contributed in multiple ways to the intensity of fires in California and the higher number of catastrophic fires we are having. "The climate in the West and elsewhere has been getting warmer and that's leading to drier vegetation, drier forest, drier bush," Swain says. "And that is acting to change the behavior of these fires, making them burn more intensely, hotter, and move faster." Nighttime temperatures are also not as low as they used to be, and firefighters have noticed that fires don't "lay down" at night the way they once did. Climate change is pushing nighttime temperatures to rise even faster than daytime temperatures. This means firefighters can't count on much help from cool nights to get the upper hand on a fire. In addition, urbanization has contributed to the destructiveness of wildfires. "There are just more people moving into harm's way," says Swain. "We have expanded our urban areas into the wildland, where there is the risk of wildfires at an increasing rate." When Trump accuses California of diverting its water supply, he may be referring to a decision expected this month by the state water board. The controversy, long a point of contention, has nothing to do with the wildfires or wildfire management. But it's a big deal. In fact, we call it: The Biggest California Water Decision You've Never Heard Of.